BMW i Store opens in London | What Car? 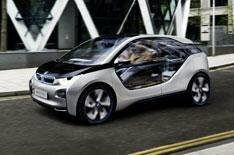 The first of BMW's i products a VW Polo-sized electric car called the BMW i3 will go on sale next year. As well as revealing an updated version of its i3 Concept car featuring a new interior in London, BMW also revealed how it plans to sell its range of i vehicles. BMW i Stores are just one method of how the company will sell its i products. Only 10% of BMW dealers across Europe will market the i range and these outlets will be supplemented by a mobile sales team, an internet sales hub and what it calls Customer Interaction Centres (CIS). A mobile sales adviser will offer potential customers one-on-one advice on BMW i products away from the traditional BMW dealership. The sales advisor will arrange test drives at the most convenient outlet. The Customer Interaction Centres will arrange appointments with sales advisors for potential customers. BMW also announced 360 Electric, a plan that takes a four-pronged approach to all aspects of buying and owning an electric car. The first part of this plan is what BMW calls Assistant Services, which combines a suite of services from the owner's smartphone. This ranges from a map-based service showing where the nearest charging point is, to road-side assistance if the car runs out of power. The second area is called Home Charging. BMW will install a car charger in the owner's home and, depending on availability, can even supply green electricity generated from sustainable sources. The third prong is Public Charging. BMW says there is a lot of work to be done to build up a public charging infrastructure, but it is working with local authorities and power companies to develop this. The final part of 360 Electric is called Flexible Mobility, where owners of electric cars could receive the use of traditional combustion-engined cars for limited occasions when journeys exceed the electric car's range. The i3 Concept car revealed at Park Lane has a new interior compared with the car revealed at the Frankfurt motor show last year. The wood used in the new car's interior has been sourced from sustainable European eucalyptus forests, while the tanning agent used in the car's leather seats is made from olive leaves. The supermini-sized i3 is powered by a 125kW electric motor mated to a single-speed gearbox. It has a range of between 80 and 100 miles, does 0-62mph in 7.9 seconds and can reach a full charge in six hours (it takes 1 hour to reach 80% charge). Top speed is 93mph. It has rear-hinged doors and no central pillar, so access to the front and rear seats is easy. There's no central transmission tunnel, which makes for a spacious cabin. Bootspace is just a little bigger than a Fiat 500's, at 200 litres. BMW revealed an electric push bike at the Park Lane showroom and says two of these i Pedelecs can fit in the i3's boot. 200 of the i Pedelec bikes will be made available during the London Olympics. Industry speculation is that the i3 could cost around 35,000, after the 5000 Government grant for zero-emission cars. BMW is also expected to offer its i vehicles on lease plans.